New Zealand is one of the most isolated countries in the world. Made up of two, vastly unique large islands known as the North and the South Islands and a number of smaller ones, New Zealand lies about 990 miles/1,600 km east of Australia in the South Pacific Ocean. Comparable in size to Japan or the British Isles but without an enormous population (only 4.4 million people total), New Zealand is one of the best kept secret treasures for adventurous travelers. Its pure beauty, ease of travel and endless things to do make it one of the best tourist destinations in the world, and a place I could only someday dream of living in. What makes New Zealand so incredibly fascinating is its diverse landscape. While the North Island is filled with volcanoes, rugged mountains, and thermal areas, the South Island is completely different and accounts for only 25 percent of New Zealand’s entire population (as of 2011 there are roughly 1 million inhabitants in the entire South Island as compared to over 3 million in the North Island). The South Island is dominated by the Southern Alps mountain chain which runs along almost the entire length of the island and is blessed with over 223 named peaks. The eastern side of the alps is dry and largely non-forested, while the west side has much more rainfall lending to magnificent rainforests, lakes, mountains and glaciers. The lack of inhabitants combined with the utterly spectacular landscape in the South Island make it a traveler’s paradise and I couldn’t think of a better way to see it than by taking a 6 hour car ride down south. My husband Paul and I woke up at the crack of dawn to birds singing gloriously and an unexpected arrival. The sun. I literally jumped out of bed and then instantly regretted it given my hangover after a day spent touring the Waipara Wine Valley and its all too delightful Sauv Blancs in the rain. But we didn’t have the luxury of sleeping in. We were taking our first major drive of our New Zealand road trip. A six-hour 479 kilometer drive heading south from Christchurch to Queenstown, the adventure capital of New Zealand and the main launching off point to see the South Island’s famous fjords. Our scenic drive would take us south along highway one through the lush, green New Zealand countryside and then head west towards the spectacular snow-covered Southern Alps and the magnificent milky blue waters of Lake Tekapo and Pukaki, where we would meet up with route 8 and head straight down meandering a little southwest to our final destination: Queenstown. I was beyond excited to start driving. We began our journey around 8 am and it was perhaps one of the most beautiful drives of my life. We passed along rolling hills, verdant countryside, lots and lots of white fluffy sheep and baby lambs (I could not even think of eating lamb after seeing those fluff balls chasing clumsily after their mamas! ), cows, vast open stretches of little vegetation, and then bounds of snow-capped mountains. One of our first stops along the way. We were driving in the middle of nowhere yet we were so incredibly struck by the beauty of the landscape that we had to pull over and take a photo. Think…Lord of the Rings! Little did I know how twisting the roads would be. The roads snaked up, down and around the rolling hills of the countryside causing my already upset stomach to grumble in complaint. A half an hour into the drive, my old childhood drama set in: motion-sickness. I felt nauseated and had a severe headache for the entire six hours of the way and forgot to pack my Dramamine! But this was a minor concern as the scenery was so incredibly breathtaking that I had to continually pinch myself to make sure I was here. 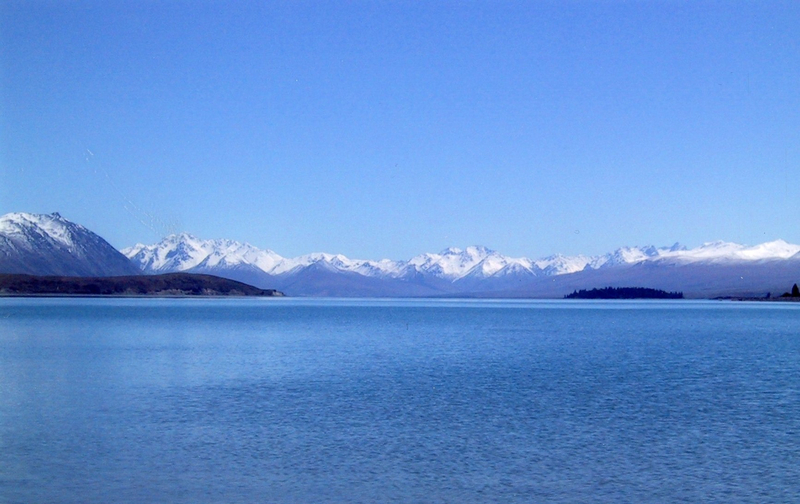 Our stop at the brilliant Lake Tekapo which gains its milky blue color from the glacial ice rasping against the rocks which produces a fine powder that gives the once translucent water a “milky” appearance. 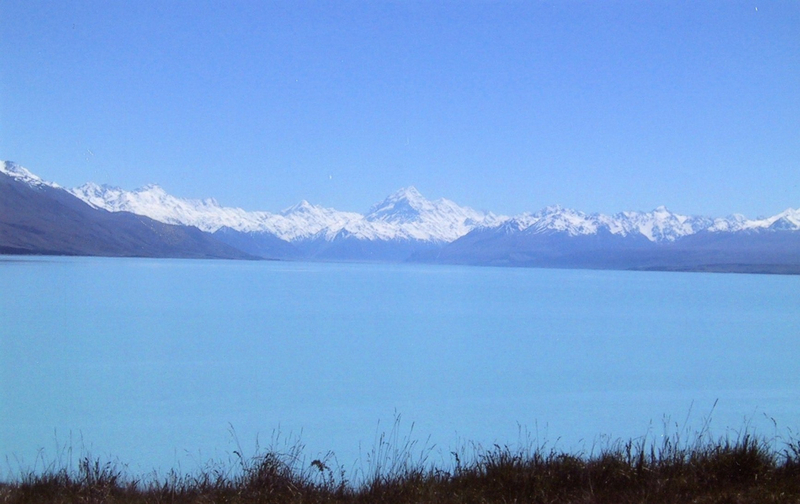 Stop number two at neighboring Lake Tekapo with sensational views of Mount Cook. 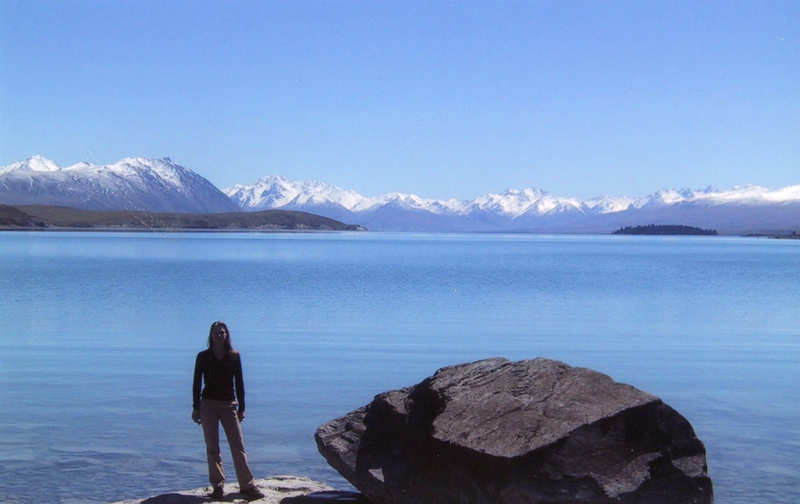 Me next to Lake Tekapo before I became a thirdeyemom! Last shot along the way with glorious Mount Cook beckoning me to climb it someday! Would we get there without my motion sickness getting the best of me? Would we make it at least an hour without my husband hitting the windshield wipers instead of the turn signal when we were trying to pass (remember, we weren’t used to driving “a backwards” car on the “other” side of the street”). Would we be ready for all the adventure awaiting us in Queenstown, home of the bungee jump and anything else crazy you wanted to physically do to yourself? Good God, Nicole, those mountains are simply stunning! I know so little about New Zealand I’m really looking forward to this series. Thanks Kathy! These pics don’t do it justice as they are ten years old and scanned. Oh…I will go back again someday and take hundreds of pictures. I agree with Kathy, just stunning! Thanks Dee for the comment! I see you are bringing your blog back to life! Congrats! I wanted to subscribe but didn’t see the email subscriber button on it. Do you have one on the site? I would love to hear all about Laos! If you have never been to New Zealand you have to go! It is right up your alley!